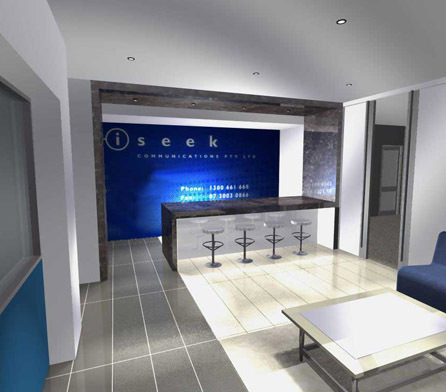 iSeek Communications Pty Ltd is a Brisbane based company servicing the rapidly growing data connectivity requirements of modern businesses. iSeek were searching for a suitable building to relocate the Brisbane city operation. Woolloongabba was chosen and Wiley was appointed for the design and fit-out. The Woolloongabba site is a state-of-the-art co-location facility with world class IP network, utilising OPTUS infrastructure. Detailed construction and services coordination drawings. The data centre shell is constructed to sustain an external fire for up to 2 hours and in the case of an internal fire, a patented Very Early Smoke Detection Alarm System (VESDA) activates a highly effective INERGEN gas fire suppression system to suffocate any flames. The data centre shell also includes a ceramic glass viewing panel to maintain the 2 hour fire rating.